Daikon oroshi means grated daikon radish in Japanese. 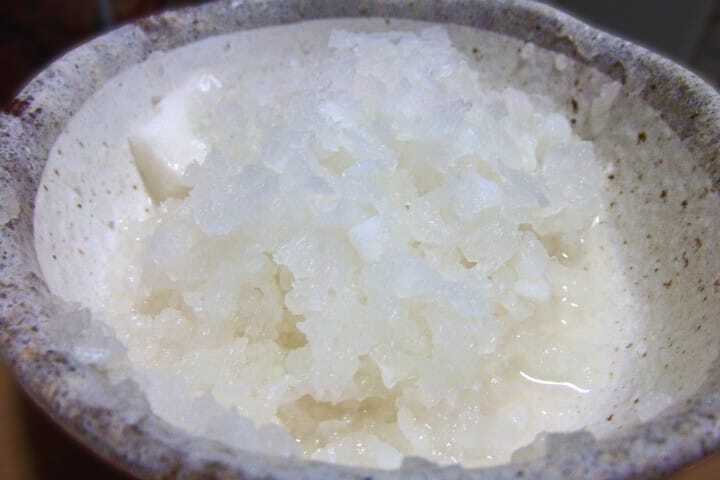 It is a traditional, white snow-like condiment that enhances dishes and also has positive health effects. Learn how to eat daikon oroshi, where you can eat it in Japan, and how to make it. Daikon oroshi means grated daikon radish in Japanese. It has a refreshing spicy taste along with a mild sweetness. You can find it often accompanying grilled fish dishes, as they are commonly eaten together. However, the daikon oroshi isn't just for grilled fish. It is also used as a condiment and a flavor enhancer for other dishes as well. In this article, we will introduce to you how to eat daikon oroshi, what are the best dishes to pair it with, and how to make daikon oroshi yourself with a simple recipe. How Do You Eat Daikon Oroshi? Many first time visitors to Japan encounter the daikon oroshi at Japanese restaurants when they order grilled fish or tempura. Daikon oroshi is a condiment, so it is not eaten on its own. It is either eaten with the main dish or it's mixed in with other seasonings. For instance, when you eat grilled fish, many people take a piece of fish and enjoy it with a dollop of daikon oroshi. The spiciness of the daikon radish blends with the flavor of the fish, leaving a refreshing aftertaste. It is also recommended to eat the fish and daikon oroshi with some soy sauce as well. When the daikon oroshi is provided with tempura, blend the daikon oroshi with the sauce instead of eating it directly with the tempura. The daikon oroshi brings out the flavor of the sauce and makes the tempura taste lighter. Raw daikon radish contains digestive enzymes such as amylase, protease, and lipase, but enzymes are weak against the heat, so it is better if eaten uncooked. That is why eating daikon oroshi with greasy fried food and fish is a preferred way of eating. Not only does it taste better, but it also helps digest the food you are eating. The grated daikon used in stews and hot pot dishes is often called "mizore" (mixed rain and snow) because of its visually slushy appearance. For this reason, stews with daikon oroshi are called mizore ni, hot pots become mizore nabe, while vegetables with daikon oroshi dressing are called mizore ae. Soba and udon noodles topped with plenty of daikon oroshi are called oroshi soba and oroshi udon respectively. As a condiment, daikon oroshi is used not only on grilled fish, but also in preparing Japanese-style burgers, Japanese-style steaks, and sashimi. For those who enjoyed the flavor of the daikon oroshi, why not make some at home? It is very easy to make. Either grate it yourself using a grater or put the daikon radish into a food processor. A grater can be easily found in large supermarkets or home ware shops. If you are in the Tokyo area, you can find them in kitchen utensil shops located in places like Kappabashi. A cheese grater also works to grate the daikon. The flavor of the daikon oroshi varies according to what part of the daikon you use, how you grate it and how much water you drain from it. It has been said for a long time that "if you grate the daikon while being angry, the daikon will turn spicy". However, for those who prefer the spiciness, place the daikon radish at a 90-degree angle and apply strength while grating it. For those who would like a mild daikon oroshi, place the daikon radish down flat and grate it with a circular motion. After grating the daikon radish, the juice of the vegetable comes out. If you add the juice into your cooking, the flavor of the dish will disappear. However, if you drain it too much, it becomes dry and not tasty. For the perfect density, put the grated daikon radish in a strainer and press it down with the back of your hand. When you take a pinch of daikon oroshi with your fingers, droplets of the juice should still trickle down. Graters also come in either rough or fine form. If you use a fine grater, you will get a fluffy texture, while the rough grater will keep the crispiness of the daikon radish. The fluffier daikon oroshi has a light flavor that is suited for tamagoyaki egg omelets and somen noodles. The crispy daikon oroshi is suited for grilled fish or as a salad. Please note that daikon oroshi begins to lose its flavor and aroma after you leave it out too long, so it's recommended to eat it as soon as possible once grated.